After the great success of its Vulcano 2.0 machine, a vibrating screen on a radio-controlled crawler, of which over 100 units have been produced for use at worksites all over the world, Laurini Officine Meccaniche now launches its new Hammer crusher. The product of extensive, targeted research to optimise the functional capability of the machine, Laurini Officine Meccaniche once again achieve distinction at the international level for the innovative power of its inventions, and for the effective performance and safety that its products offer and guarantee. Adaptable to many kinds of terrain, the machine is equipped with a sturdy crawler truck capable of working on steep slopes with up to 70% gradient. 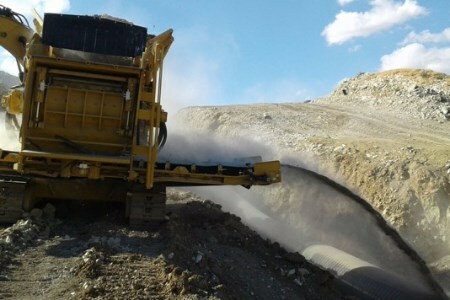 A special feature that contributes to increase the fame of Laurini Officine Meccaniche equipment in the earth moving and pipeline sector, with respect to the uses made until now, is the ability of the Hammer crusher to crush large pieces of rock and turn them into fine sand, which is then deposited directly in the excavation. It is a revolutionary quality that has led to a significant increase in the order portfolio just for this machine. “The main features of our new Hammer are the rate of production that can reach as high as 150 m3/hr, without the necessary presence of an expert operator, the small size of the output, with minimum granulometry of 0 - 15 mm and maximum rock input size of up to 500 mm,” says Marco Laurini, President of Laurini Officine Meccaniche. “The engine is a Caterpillar 440 hp with emissions in line with the EPA Tier 4 Final Regulations for High Regulated Countries and with EPA Tier 3 for Low Regulated Countries. Our team, just to guarantee the best performance of its clients, bases its work on innovation, safety and technology. The duration and yield in time of a Laurini machine depend on a company philosophy that is aware and attentive, strongly focused on handling with determination situations that are constantly changing, and requests that are increasingly specific coming from both old and new markets,” concludes Laurini.